I once knew a girl who spent time working at a butternut squash farm, and I’ve never been able to look at them without smirking ever since. 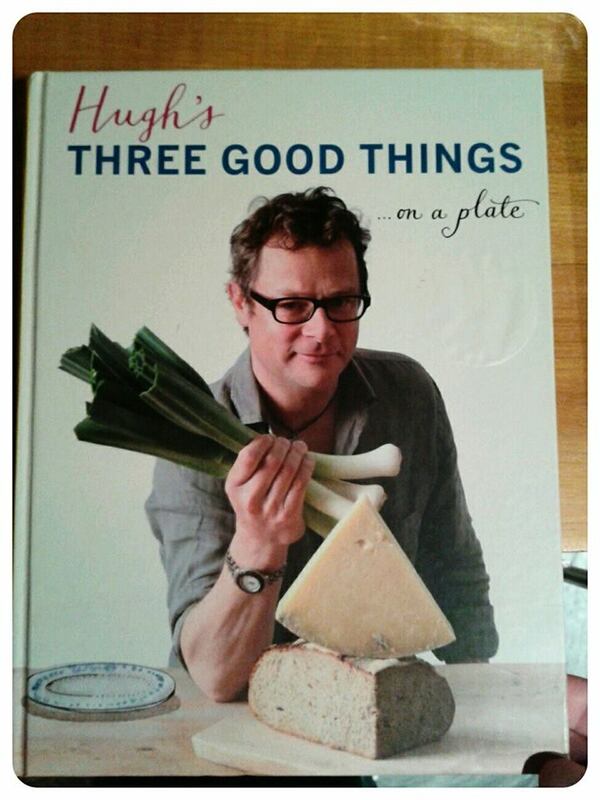 However, I was flicking through the books looking for something simple to cook and found this recipe in Hugh Fearnley-Whittingstall’s ‘Three Good Things on a Plate’ on the page after the lentil curry that stank my flat out (https://newrecipenight.wordpress.com/2014/02/21/week-20-lentils-spinach-potato/). It meant getting over my squash-giggles, but this week I bought my first ever butternut squash. It’s surprisingly difficult to buy a small one – small being 1kg. Who knew? The recipe makes enough curry to serve 4, I would recommend making it in the same quantities as the recipe and freezing half if there’s only two of you (unless you have half a tin of coconut milk handy). 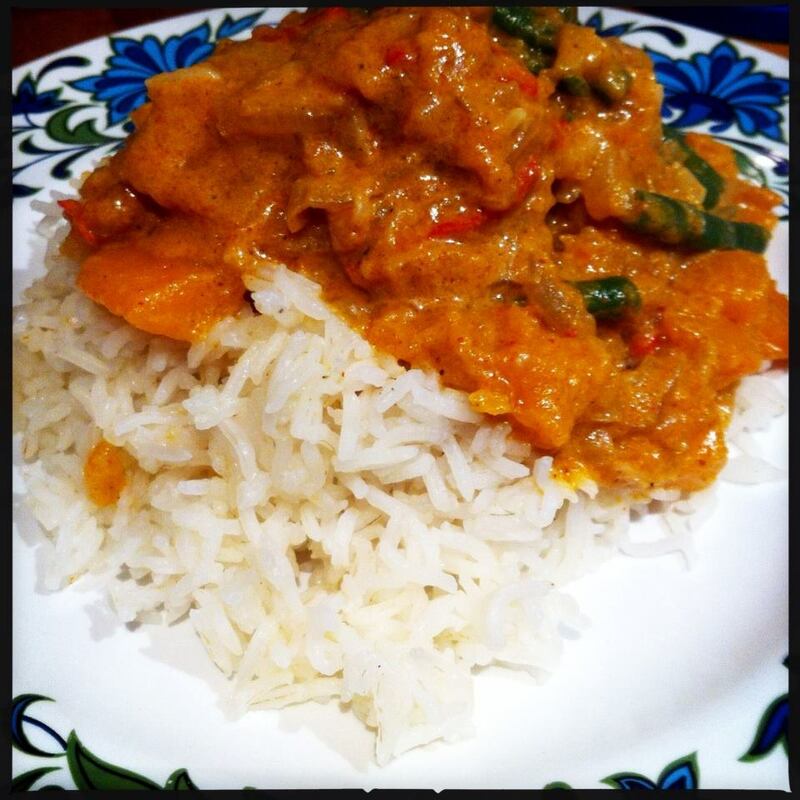 To make this curry you will need: A Squash (800g-1kg, either a Butternut, Kabocha or Crown Prince Squash), Sunflower Oil, 1 Onion, 2 Garlic Cloves, 2-4 Mild or Medium Red Chillies, curry powder/curry paste, Coconut Milk, a Lime or a Lemon, Salt and Pepper. Since making this I have found out that you can buy prepared chunks of butternut squash, and vegetarians have lots of hacks to make the preparation of them much quicker. I had no prior Squash-knowledge, and spent ages wrestling the squash into peeled and de-seeded bite-sized chunks with my battered old 50p peeler. 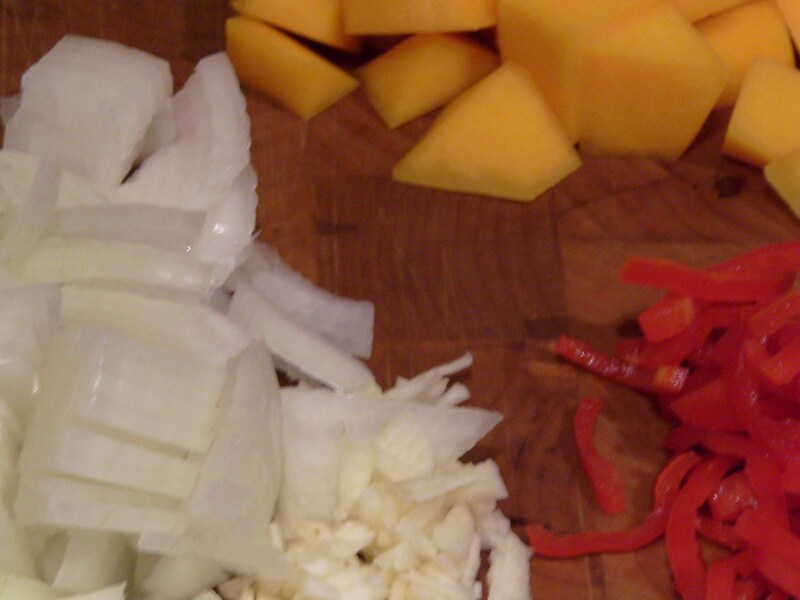 While you’re at it, thinly chop the onion, garlic and chillies, and lay them out on your board as if you’re a Blue Peter presenter (see above). Heat 2 tablespoons of sunflower oil in a large saucepan, and gently cook the onion over a medium heat for 10 minutes. Add the garlic and the chillies and after two more minutes stir in a tablespoon (or two) of curry powder/curry paste and cook for a few more minutes. Pour in the coconut milk, stir, cover, and simmer for 20-25 minutes. After 15 minutes I tossed in some fine beans like Hugh suggested. Every so often I gently stirred it, as directed. When the squash is tender, turn off the heat and stir in the juice of a lemon or a lime; I chose a lime. 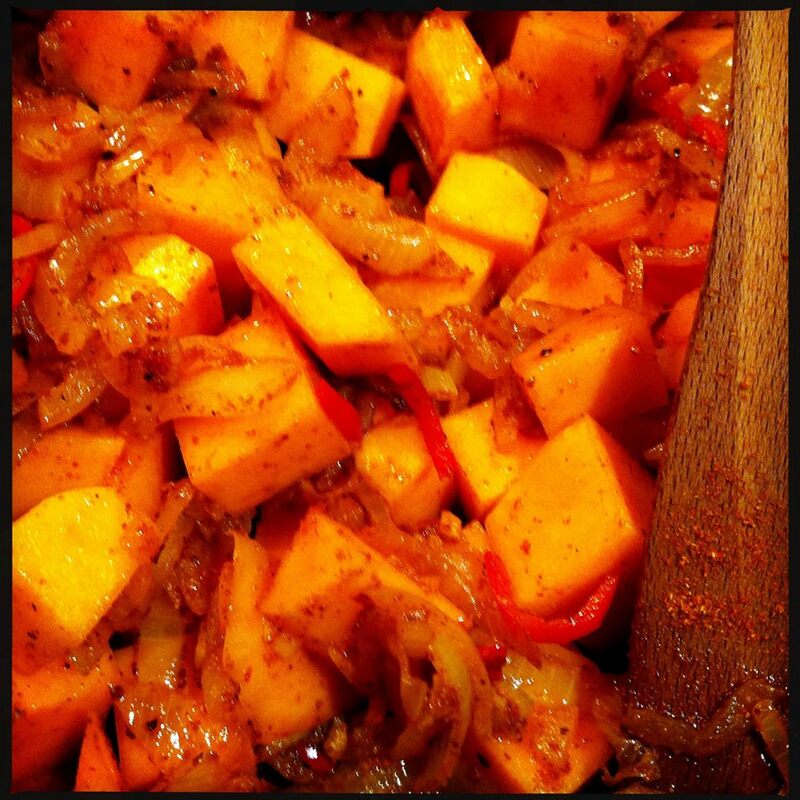 Just as I started cooking the squash my lover came up to me and asked if I thought butternut squashes were like pumpkins, which he is insanely allergic to… but what’s a meal without a spot of peril? Luckily dinner didn’t kill him, and it has been requested again. I put 2 chillies in but next time I’m going to put 4 in, or use stronger curry powder, or both. A delicious curry which makes the flat smell lovely.